Hi friends! How are you today? It’s already October on the calendar, but behind my window is still summer. Guys, I wanna yellow leaves, cold wind and warm sweaters! My graphic print skirt is totally reflecting my mood. Hey, autumn, where are you babe? I’m waiting for you! Привет, друзья! Как ваши дела? На календаре уже октябрь, а за моим окном солнечное лето. Я хочу желтых листьев, шуршащих под ногами, прохладного ветра, теплого чая и вязаного свитера. Эта охристая юбка-карандаш с графическим принтом полностью отражает мое настроение. Эй, осень, ну где же ты? Тебя здесь давно ждут! Merhaba herkese! Nasılsınız? Ekim ayının ortasındayız fakat dışarıda hala yazdan kalma hava var. Ben ise sonbaharın gelmesini, yaprakların sararıp düşmesini istiyorum. Elbisemin renkleri ve desenleri adeta ruh halimi yansıtıyor.Sonbahar nerdesin.Seni bekliyorum. love this outfit, so trendy and elegant! ;) kisses! Мне очень, очень нравитcя эта джинсовая рубашка! И она Вам невероятно идёт! Сочетание с юбкой неожиданное, но стильное! I love your outfit!The skirt print is amazing!!! But you are soo pretty you'd look good in anything!!! Love your skirt, very Missoni! Hi dear, lovely look and pretty colors! I love your skirt and bag. adore your skirt! and love your shots! your print pencil skirt is gorgeous! The skirt is fabulous, especially because of the color. The shoes are awesome too :) Really pretty. 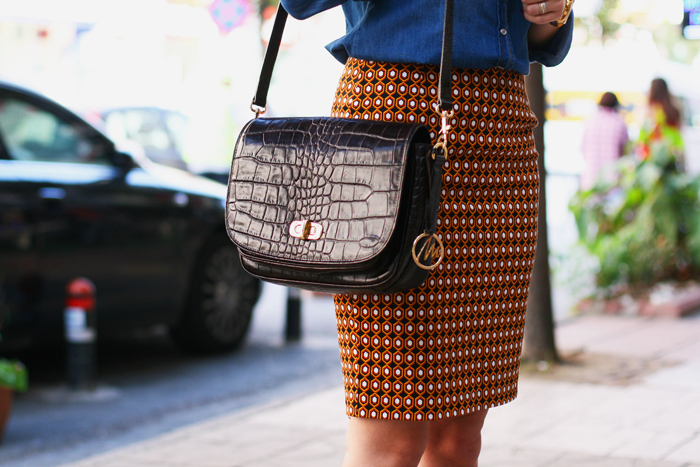 Love the denim shirt and patterned skirt! 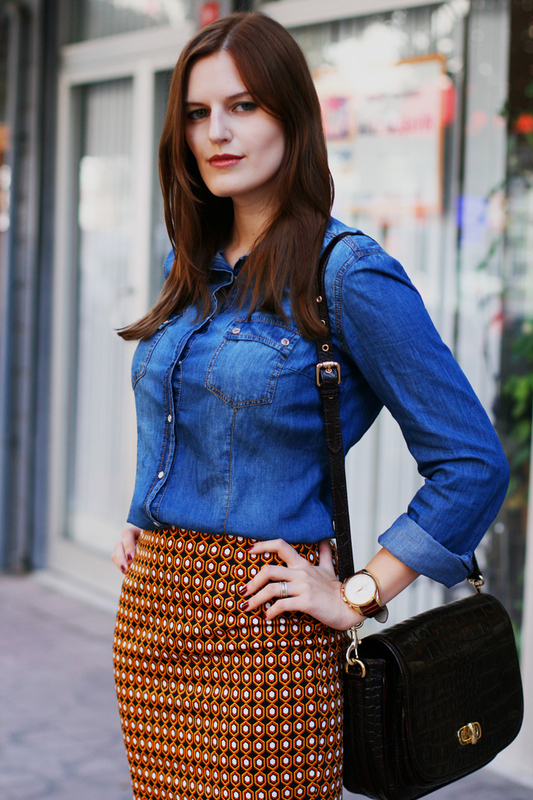 Hi dear, love your style interpretation of the graphic skirt, looks terrific on you paired with denim! Love the print on this skirt! You look amazing! I love your printed skirt!!! great outfit, love the shirt with the skirt! lovely skirt, looks great on you! You are always wonderful and your look is amazing!! :) The skirt is so beautiful! p.s. I'm waiting for the autumn too!! Ох, мне бы сейчас такую осень-лето! У нас только два последних дня светит солнышко, а так холодно, пасмурно и очень дождливо :( Не люблю осень такую. Great photos as always and this outfit is so pretty. Lovely shirt and skirt. Love the fantasy of your skirt! Love the denim with that print..great mix hun! Юбка шикарная! Сочетание с джинсовой рубашкой просто чудесное! The outfit is so beautiful and the hair color goes so well with the color of the skirt. I am doing a fashion friday post and I would love for you to stop by and visit. I love this look! Your skirt is stunning!!! Great outfit! 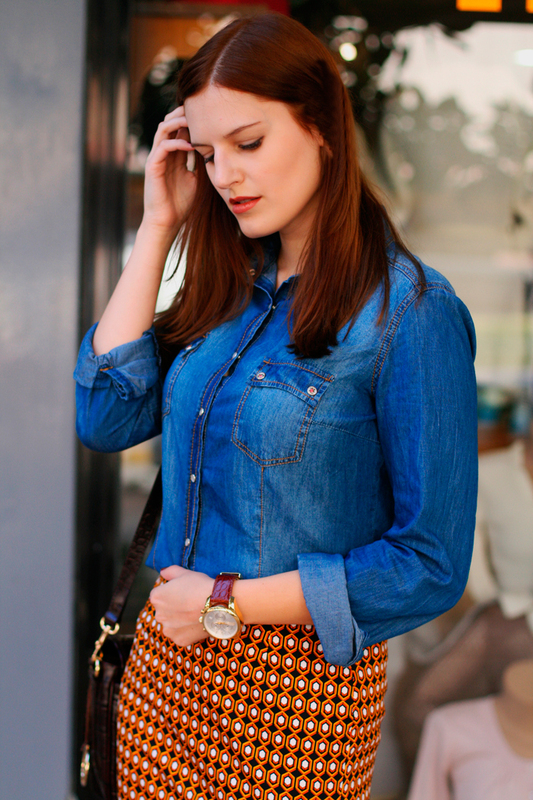 Love the cute colourful skirt with the simple denim shirt. I really need a good fitted denim shirt! so perfect!! :) I want that skirt:p I have a new post now and would love to know your opinion on it!! This skirt print + jeans = perfect <3 love it so much!!! How amazing is that skirt! You combined it so well with that denim shirt! Lovin it! Thank you so much for your comment nd thanks for following back! I love that skirt and it looks amazing with the shirt and shoes! Thanks for the nice comment on my blog. Would you like to follow each other? looks so much like a magazine fashion cover, u look hot and amazing! Yes I agree!! Where is Fall, it's still so warm. I love that skirt, beautiful outfit. 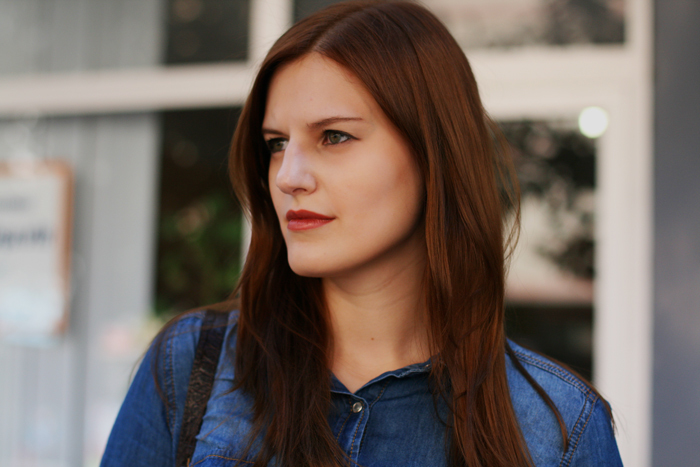 Love your style and your whole blog. very cool skirt! I wish it was more summer like here! Great outfit BTW! I love it! Love this combo! Great colours. your skirt is just gorgeous! I love it paired with the denim top! Love the outfit! The graphic print skirt is stunning! Great blog, can't wait for your next piece! 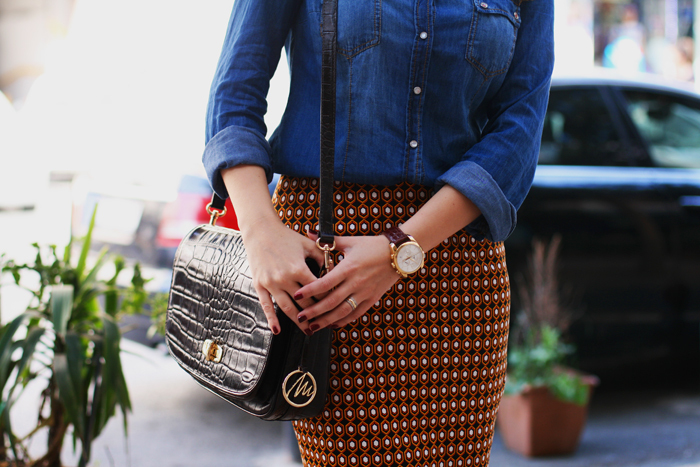 That skirt is stunning and I love it with the chambray. Absolutely stunning! Just loving this outfit and all the fun colors! You look so beautiful! I love your skirt! AMAZING PICS:) I love the colors in this post....great job. These photos totally scream autumn! I really love how you paired that skirt with the denim shirt. You look stunning! The skirt pattern is amazing! This look is my favourite of the whole day! I love that print on your skirt. The denim shirt is such a rich blue. Brilliant job! Thanks for your comment on my blog! Yes, I sure would love to follow each other! Such a lovely fall skirt!! Especially paired with the chambray. Hope fall comes your way soon! Thanks for your comment! I love to know your blog! I love your style a lot! 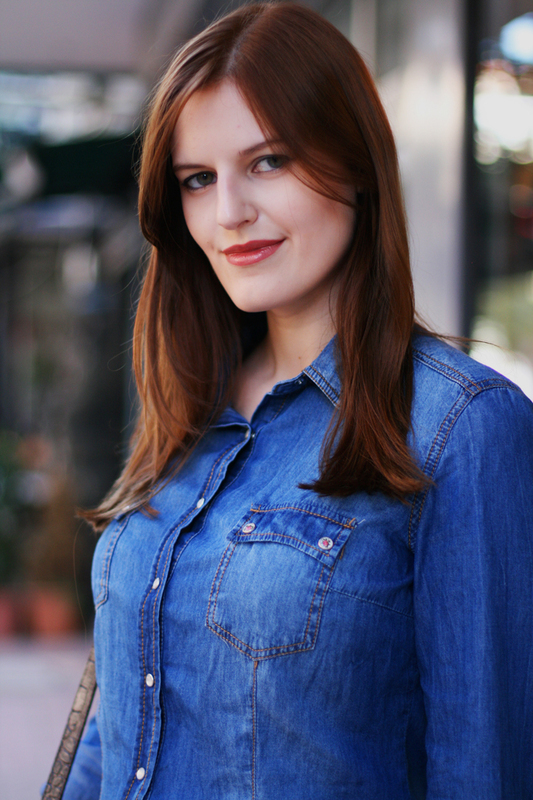 Your outfit is perfect is very chic and casual at the same time, the denim shirt is beautiful! Yeah sure I will be follow Your blog! o mine, you're so PERFECT!! Beautiful outfit!!! nice blog!!! thank you so much for your comment! i love your skirt, the colors, the cut, everything.. is perfect. adn btw, i like your blog. what do you think about following each other? this skirt is nice! love the whole look! wow i love the print of your skirt! how amazing it looks with the denim shirt! so so so beautiful!!!! the skirt is gorgeous!!! Lovely fall look, such a pretty skirt! That skirt so cute! Love the pattern.